John Bentley is part of an exclusive club of players to represent his side in both Rugby League and Rugby Union disciplines, as well as overseeing the transition to professionalism in the sport. An English dual-code rugby great, he made his Rugby Union debut against Ireland in 1988 aged 21, and made an immediate effect in his national squad, becoming selected for the summer of tour of Australia shortly after. John went on to train as policeman in the pre-professional era of rugby before switching codes in order to play professional Rugby League. Again John was picked for his national squad for the 1995 Rugby World Cup whilst playing for Leeds, Halifax and a short spell with Balmain Tigers in Australia. Bentley has experienced sport across the world and played against some of the most revered sportsmen of the era, making him a highly sought after sports speaker on the after dinner speaker circuit. As Rugby Union turned into a professional sport, John returned to the code by signing for the Newcastle Falcons in 1996 and guided them to their only victorious Premiership campaign. John’s impressive performances led to him touring with the British and Irish Lions in 1997, playing in the second and third tests. John was part of a squad to be only the third team to win on a tour to South Africa. John’s drive and determination at the time to achieve peak performance is a skill relatable to both social and business environments, making him an ideal rugby speaker for all kinds of events. 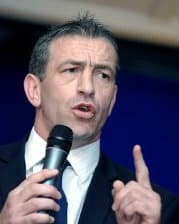 A pre-eminent Rugby speaker, John played in one of the most transformational and interesting periods of both Rugby League and Rugby Union. John’s extensive knowledge of the sport gives him an excellent grounding to engage and interacts with fans of the sport during after dinner speeches and question and answer sessions.